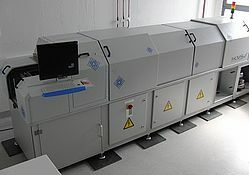 The peptide laser printer is the core of PEPperPRINT's peptide microarray technology and was developed in line with the PEPLASER FP7-HEALTH project. 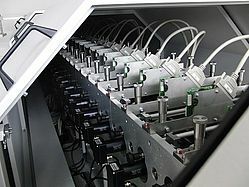 The custom high-tech instrument is conceptually based on a conventional laser printer, but also contains image recognition optics for glass slide alignment as well as a linear stage and precision mechanics for repeated printing with micron resolution. In contrast to a standard 4-color laser printer, the peptide laser printer accommodates 24 amino acid printing units for the 20 main L-amino acids as well as additional other monomers like D-amino acids and citrulline. Consequently, the peptide laser printer is far from a tabletop machine with a length of 4.5 m and a weight of more than 3.5 tons. The robust contruction with monolithic building blocks avoids any imprecision due to e.g. thermal buckling or ground vibration. The peptide laser printer is further equipped with a suited software interface that is linked to the image recognition optics and the peptide microarray design software PepSlide® Designer. Based on individual data matrices engraved in each production slide, the software interface automatically assigns printing patterns to the respective slide. The combination of high-precision mechanics, a massive scaffold and sophisticated software solutions enables the on-glass printing of peptide microarrays based on amino acid microparticles. Up to 275,000 spots are printed within a minute, providing a high production throughput with state-of-the-art peptide microarray spot densities and thorough content flexibility.